I do not hide my fascination with all things supernatural. Certainly here, I have explained time and time again how great True Blood is, if for no other reason that the beautiful warrior named Eric. While I have spent many years reading tales of vampires, lamenting Anne Rice’s on again off again decision to discontinue writing about them, and making sure I see every movie about them that gets made, I will admit, they may not actually be my favorite monster. Of course, I am the person with an alarm set to buy tickets for the new Predators in advance so maybe all monsters are my favorite. It’s my dad’s fault really. When I was in the third grade, we lived in a house where the den was at the opposite end of the house from the bedrooms. Logically I know I never awoke in the middle of the night because I heard something, but more because it became habit. My dad, you see, had insomnia and lucky for me, a willingness to override common sense and my mom’s rules any time he saw fit. I don’t remember my first episode of Dead Eanest and Shock Theater (rumored to have been Ted Turner), but only that a regular rotation of B-movies educated me on the finer points of Lon Chaney Jr. and Bela Lugosi’s monsters. I would watch through the fingers of my tiny hands, subduing any shrieks that would rise in my throat just to maintain the privilege of sitting on the daybed in the den. Soon I learned to love the Twilight Zone, The Night Stalker and any form of creature or intense psychological terror. No wonder I am warped. 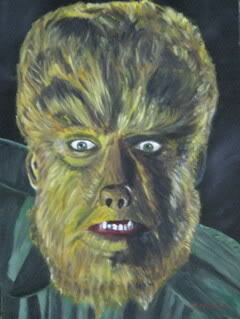 For whatever reason, despite my love of vampires today, my favorite was Lon Chaney Jr.’s werewolf. It would be years before I would understand where the legend arose. I didn’t know lycanthropy was even a word, much less a disorder that is rumored to have existed at a time. My first modern werewolf would appear gloriously in An American Werewolf in London. The pain of the change terrified me and I remember being in utter disbelief. When Michael Jackson then recreated the change for Thriller, arguablely better by the soliloquy of the incomparable Vincent Price, it just went to solidify how fabulous a monster this was. Stephen King took a turn and as always, I love his books so much more than the celluloid reproduction. Driven by rage and moon shine, a man beast with super human strength is set loose on populations to exact his revenge. How can you get better than that? One of my favorite series of movies now is undoubtedly Underworld, which deftly combines vamps and weres in a more modern take on the tale. Regardless of glorious special effects and black leather wielded by Kate Beckinsale, I will not lie when I admit I was smitten with the newest creation by Benicio Del Toro in The Wolfman. Here was a return to the Chaney wolf I loved, a deep and moving portrait in the traditional werewolf saga. I could just eat that movie up! Next Post Yeah for Star Trek Humor! Sorry! 🙂 I will say that Cycle of the Werewolf was far better than the movie Silver Bullet. Ebay is the best place to start for older, used books.